Growing up in the seventies I was a socialist. I was a pretty moderate socialist, but a socialist nonetheless. But as I thought things through and became more aware of how the world was, I began to realise that socialists had two huge problems. The first was the USSR. The Union of Soviet Socialist Republics was very obviously socialist, they even had it in the name. It was also very obviously not somewhere to be admired. For a start there was the violent repression of dissent. But bad as that was, there was also the problem that it was just a bit crap. I should point out that back then there were enough statistics and facts around that you could put together a reasonable case that the USSR was a serious contender. It is hard to remember it now, but there was a steady stream of articles pointing out that the USSR had done this or that, or was achieving the other. I seem to remember that it trained more engineers than Europe and America combined in 1975 or something. And even after the Americans landed on the Moon the Soviet space programme still looked pretty impresive. But by then it was already starkly obvious that Russia was not a great place to live and was not a beacon of light to the rest of the world, no matter how many cameras or cars they made. I don’t think many foresaw it collapsing, but nobody thought it was actually going to overtake the capitalist world. So if you were a socialist you always had to be explaining why you were different to those other people who also called themselves socialists. It was a real drag. “Why don’t you move to Russia then?” It wasn’t easy to answer that one. And even if you could answer it there was always the accusation that you hadn’t thought it all through. You might not actually want gulags, secret police and a shortage of consumer goods, but that would be what you would inevitably end up with. It was simply the natural consequence of pursuing socialist ideas. That was how the Russians had ended up there after all. But there was an even bigger problem, which was the United States. This was manifestly not socialist. And it was also manifestly powerful and successful. This meant that whatever else you might think, there was a big powerful country that was likely to oppose any socialist initiatives. This again was bad enough in itself, but again wasn’t the worst thing. There was also the undeniable fact that American goods were frankly highly desirable. And on top of that ordinary Americans were not just not being oppressed by the state, they were undeniably well off. This contradicted the basic ideas of socialism head on. The workers were supposed to be impoverished by unbridled capitalism, not given cars, jeans and television sets. The Americans not only had guns, planes and ships enough to get their own way, they also seemed to be having the most fun at the same time. So as a socialist I had to explain not only why I wasn’t like the obviously unpalatable socialists in Russia, I also had to come up with an excuse for why the Americans had it so good when their system was supposedly so bad. I don’t have time here to justify why I was still a socialist despite these problems. I still am a socialist even after thirty five years of thinking it over so lets just leave that for now because what I want to talk about is why the arrival of Ronald Reagan was such a good thing for me as a socialist. Basically he is the man that removed two of my biggest political problems. First of all, he was instrumental in destroying the Soviet Union. His build up of forces and aggressive diplomacy placed a huge strain on the communist economy. To keep up they were forced to devote ever larger proportions of their productive resources to building the weapons they might need in the event of a war. This prevented them from developing consumer goods to keep their population happy and drove them into a cycle of escalating crises of economic failure which in turn led to loss of political legitimacy. Basically Reagan spent them into submission. It was an impressive use of coercion combined with diplomacy. I think the aim was to weaken rather than eliminate the USSR, but in the end the only country that could plausibly claim to rival the US collapsed totally and has subsequently fallen apart into a dozen or so states. None of them has chosen to remain socialist. So that was good. Reagan’s swaggering spending on weaponary had got rid of my biggest embarrassment, and with surprisingly little loss of life. A little noticed cosequence of the fall of the Berlin Wall in 1989 was that social democratic governments started appearing all over the place in Western Europe. Even the highly conservative British managed to get a left wing government, of sorts. 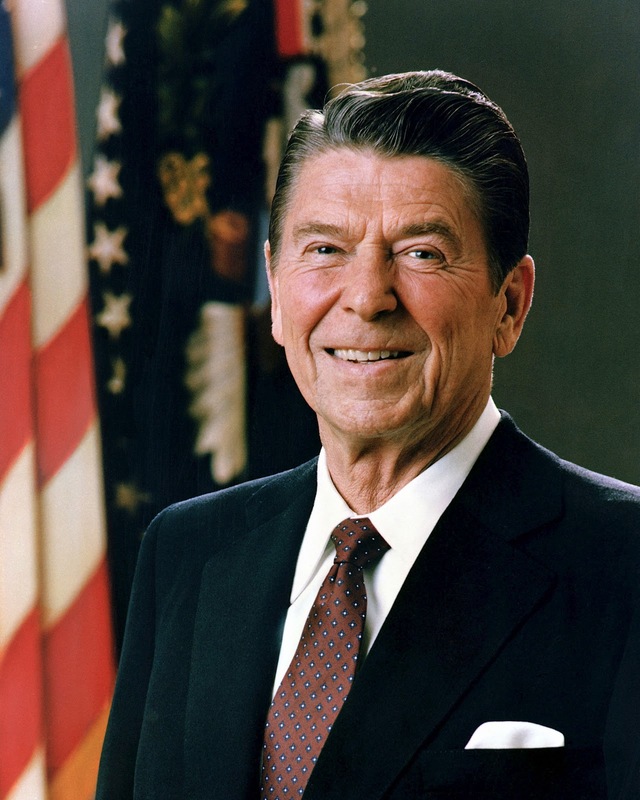 It no doubt could be argued that it wasn’t down to the personality of Reagan and that history is driven by deeper forces and one man’s actions cannot be that influential. But I have to say, that it really does look to me like it was more Reagan’s doing than anyone else’s. So thanks for that Mr Reagan. I appreciate it. The other thing Reagan did was make the US much less of a problem than they used to be as well. They are stronger militarily than they ever used to be, to be sure. I don’t have the figures to hand but I think the US spends more on its armed forces than the rest of the planet put together. That is simply a fact of life and most of us have got used to it. Nobody can fight the Americans and hope to win on their own. No conceivable alliance of countries can fight them and hope to win either. In fact, not even if every other country joined together – including Canada – could they win. So Reagan’s legacy is still very much alive in that respect. And this isn’t imperial overstretch either. This collosal level of defence spending is something that the US can easily afford. I don’t have the figures to hand, but it is still a very manageable proportion of the total US economy. I think it is 6 or 7% or so – the number doesn’t really matter the point is that they can do it without having to make unbearable sacrifices in other areas. But there is something odd about the way Reagan went about financing his undoubtedly successful projection of worldwide power. For some reason, he chose to fund it not out of taxation but by borrowing. And it was a choice, not a necessity. The US economy was certainly capable then and is still capable now of generating much higher tax revenues than it choses to do. And it isn’t just taxes generally that if forgoes, it is mainly the taxes on the wealthy. While fighting the cold war Reagan cut taxes for the rich. And subsequent administrations have either not reversed this policy or have even taken it further. It is an amazing thing to observe. Taxation is a difficult business and often has unintended consequences. I am with the emperor Augustus on this one. He described taxation as the vexing art of fleecing the sheep without skinning it. A generation of extremely low marginal taxation in America coupled with a ballooning deficit has brought about some astonishing changes to America. The America I grew up with had the annoying feature of combining some very rich people with a large numbers of pretty comfortable people. There was an underclass of very poor people, many of whom also had high levels of melanin in their skin. But it was possible to regard that as work in progress that would be dealt with in good time. It looked far from a bad place to live, particularly if you had a low melanin level. In fact it was desirable enough that even with high melanin it was still preferable to most other spots on the planet. It was also a nightmare for us socialists to explain away. But I don’t think the post Reagan United States is like that any more. You have some really really rich people, but you also have much much larger numbers of people for whom prosperity seems either unobtainable or for whom holding onto it seems a much more precarious business than it used to be. It isn’t that the US is less prosperous overall, it is just much more unequal. A country which has as much literal firepower as the United States is always going to command a particular kind of respect. But I don’t think that it was that kind of power that made it great, not on its own anyway. It used to be the place that everyone wanted to go. It was a common joke that if you saw an agitated crowd outside a US Embassy you needed to check whether they were protesting or trying to get visas. You could criticise the place all you liked, people voted with their feet. And everyone wanted American fashions and products. I don’t think it is like that to anything like the same extent any more. And there is another consequence to Reagan’s carefree approach to matters fiscal. The fact that the US is a net debtor does place a huge restraint on its freedom of action. I don’t want to exaggerate this. The US remains pretty credit worthy and is hardly on the point of collapse. Washington is still the go-to place if you want to get something done. But nonetheless it would be a lot more powerful and influential if it didn’t need to keep creditors and potential creditors sweet. Reagan’s deficit does impose a cost that offsets the benefits of all those aircraft carriers and missiles. If you are a socialist, it is no longer imperative to explain away the success of the American way of doing things. I never expected that would happen in my lifetime. All I can say is thank you Comrade Reagan.